Tom Cruise? In a cockpit? No, too easy – I think I'll pass. 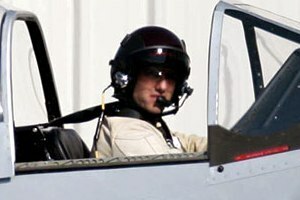 Why does he look much more authentic sitting behind a stick in the make-believe "Top Gun" than he does in real life??? PS. You can come out of the closet now Tom!!!! Sorry. Had to go there. Oh, please! We don't want him.